There are many different brands of pre-made mashed potatoes available today. I used a batch to put together this delicious appetizer. The pre-made mashed potatoes make the recipe easy to put together. To roast the garlic; cut the top off of one clove. Drizzle olive oil over the exposed garlic and wrap it loosely in tin foil. Roast the garlic in a three hundred and fifty degree oven for an hour. Unwrap the garlic, and allow it to cool for at least ten minutes before removing the cloves. Place the potatoes in a medium sized mixing bowl. Add the garlic by gently removing each clove from the skin; this can be done by squeezing from the bottom and helping to pry the cloves out with a fork or a knife. Combine the garlic and potatoes well by hand. In a food processor, combine the corn flakes, parmesan, pepper flakes, and black pepper until the mixture becomes smooth. 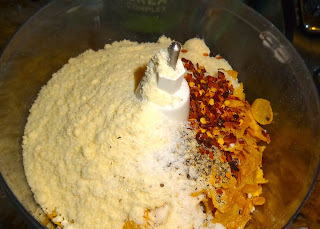 Place one half of the breading in a medium sized bowl and add the other half to the potato mixture. After stirring half of the breading into the potatoes well, form small balls of the mixture by hand. Before placing the bites on a cookie sheet, roll them in the remaining breading mixture to coat them well. When all of the bites are on the cookie sheet, drizzle them with olive oil. Bake in a three hundred and fifty degree oven for forty minutes. Allow to cool for five minutes before serving. Enjoy!